Siemens has replaced this with newer models at the Siemens Life Series page. The Siemens Acuris Life’s modern approach will blend seamlessly into your lifestyle. An innovative Open Fit hearing aid, it forgoes traditional methods, such as earhooks and conspicuous controls in favor of small casing and comfortable and nearly invisible tubes paired with Life Tips. It’s made to naturally blend in with hair and skin tones. Its small flexible tubes (Life Tubes) are not only discreet, they also leave your ear canal open, so hearing is more natural. 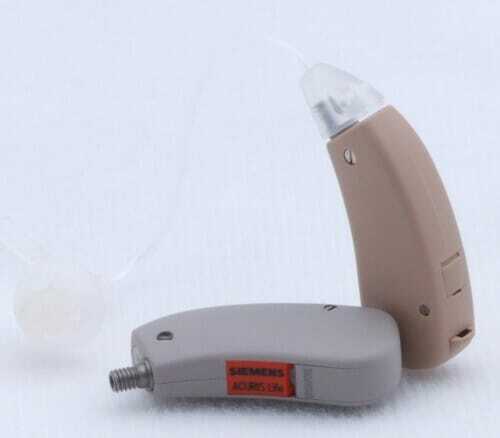 The Siemens Acuris Life is ideal for those with mild to moderate hearing loss including ski slope configurations and other high frequency losses. Its low profile design makes it a great choice when style is a must. Low noise, and high battery life – up to 140 hours – are also great advantages to this device.